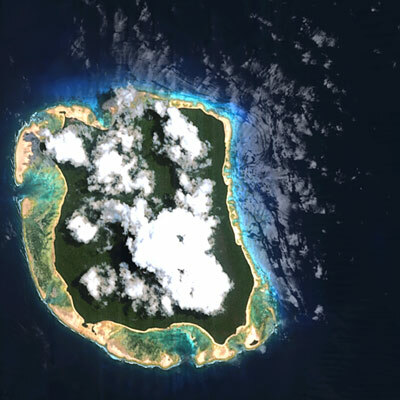 This is a satellite photograph of North Sentinel Island, one of the northernmost outposts of the Indian-owned Andaman archipelago in the Bay of Bengal. North Sentinel is seventy-two square kilometres in size (that's a little over half the size of Waiheke Island), and can be reached in a few hours by boats leaving from Port Blair, the administrative centre of the Andamans. Container ships and fishing boats regularly pass its shores. The Sentinelese are making news around the world because of a recent incident in which two drunken Indian poachers landed their boat on North Sentinel Island, only to be set upon and hacked to death by two locals wielding axes. To the anger of some of the Indian inhabitants of the Andamans, the Indian authorities have been reluctant to investigate the deaths of the poachers, suggesting that the hostility of the Sentinelese and the need to preserve the isolation of North Sentinel Island preclude any serious attempt to bring prosecutions. The widespread media coverage that the slaying of the poachers has received suggests a fascination with the inhabitants of North Sentinel Island. What fascinates me is the very finite, specific location of the Sentinelese - not in some vaguely-defined portion of the rainforest of Brazil or New Guinea, but on an island which anyone can locate on a good map - and their relative proximity to the world of the twenty-first century. There must be many parts of New Zealand which are remote from 'civilisation' than North Sentinel Island. Intrigued, I searched the Web some more, and found almost nothing: a few sketchy wire-service reports about the grounding of the Primrose, and the home page of an evangelical organization in California that listed the inhabitants of North Sentinel (along with Buddhists, Jews, and "Gays in San Francisco") in its database of 1,573 "unreached peoples." I remember how unreal the place seemed, that night in my fluorescent-lit office, as I surfed on the oceans of information, the island emerging and then submerging again. "That they voluntarily came forward to meet us - it was unbelievable," he told me, the last time we met at my hotel in New Delhi. "They must have come to a decision that the time had come. It could not have happened on the spur of the moment. " "But there was this feeling of sadness also - I did feel it. And there was the feeling that at a larger scale of human history, these people who were holding back, holding on, ultimately had to yield. It's like an era in history gone. The islands have gone. Until the other day, the Sentinelese were holding the flag, unknown to themselves. They were being heroes. But they have also given up. "They would not have survived forever - that, I can reason out. On a scientific basis, we can say that this population might have lived for another hundred years, but eventually. . . Even destruction takes place in the natural course of things; no one can help it, it happens. But here we have been doing it in a very conscious way, knowing full well what the consequences could be. What would be and what could be are the same." 'These murders were tragic but they happened because the laws of the area were not upheld. In the Andamans the law strictly states that people should be kept away from Sentinel Island as any contact with the outside world is potentially deadly for the Sentinelese. For a start they are incredibly susceptible to common diseases to which they have no immunity. It's hard to disagree with Ross, but I wonder how much of the desire to see the Sentinelese way of life preserved is motivated by the same sort of romanticism and exoticism that saw so many indigenous people being exploited by European explorers, ethnographers and artists. Is there not a sort of strange comfort that we in the 'civilised' world derive, from knowing that at least a small group of human beings exist outside of our world, in a land that time forgot? Do we want to use Sentinel Island to create a sort of refuge from the real world in our imaginations, an Eden of the mind? In the nineteenth century, the English displayed some 'friendly' Andamese Islanders in Calcutta's zoo. Today we shudder at the memory of such a practice, but do we not want to make a sort of zoo of North Sentinel Island? "Pretty weird, but cool that there's still a group of people isolated enough for this to happen (as long as it isn't me getting killed of course)"
I have the distinction of being the pilot which flew the rescue helicopter, which rescued the crew of the Primrose from North Sentinal Island. It is good to see that the entire episode did not simply disappear into the shadows of time. It was a memorable event for those of us involved. hahaha at the end some outsider will buy the damn island and the people will not be available to enjoy it, this is how things works. I would like to live in a place like that because you can exercise your mind because if you want something to be done you need to think about it with caution. If you invade my property and home and I don't want you there, I shoot you. I'ts not murder, it's protecting whats mine. Not only that it's legal. That's how I view the Sentinelese. For anyone to suggest they 'murdered' outsiders is just insane and displays vast ignorance of human existence beyond their own fragile little lives.